"My second Pistol Ultra in the books!" 2019 was my second year in row to run the Pistol Ultra. As last year, the quality of the race management/race director show through in all of the details from the swag to the aid stations. All details seem to be thought out. I ran the 50 miler this year. It starts at 8 pm so we ran through the night; the course is well lit, I did not need my head lamp or Noxgear vest. The aid stations had warm broth, bacon, doughnuts, any type of snack, gels, hydration you needed. I cannot say enough about the course or the volunteers-they are amazing! I highly recommend this race to someone thinking about their first ultra distance. "Inaugural Falls 100 Trail Ultra Race "
Heavy rainfall in the weeks/days leading up to this race made these former ATV trails a muddy mess! This is a 13.1-mile loop course with 4 aid stations on course. The course has some elevation change to it, but nothing that is unmanageable. The majority of the elevation comes in the form of ATV paths that go straight uphill (no switchbacks). The scenery is beautiful and the course is full of wildlife. The race management course is working to build up the trails now that the ATV park is closed and a hunting preserve is being placed on this private property. There are a few miles of road included in the loop-mainly to get onto the trail and then off the trail back to the start/finish line. The race directors/race management company was amazing and very accommodating. The aid stations were well stocked, we never ran out of water or electrolytes, and the course was well marked as trail races go. I loved the swag and the course scenery. As we left, we told the race directors we would be back in 2019, pending no crazy rainfall amounts in the days leading up to the race! "Running down a dream at the NYC Marathon!" I ran the 2018 TCS New York City Marathon as part of Charity Team Every Mother Counts. I had tried to enter as part of the lottery but did not make it in 2017. Then the opportunity for the charity bib opened and I had to try! Running NYC Marathon was like a dream! The expo is amazing with so many awesome vendors. I loved having the opportunity to see so many people from around the world in one expo. I also loved the electricity and energy you received from attending. Lots of photos ops, samples, etc were available. 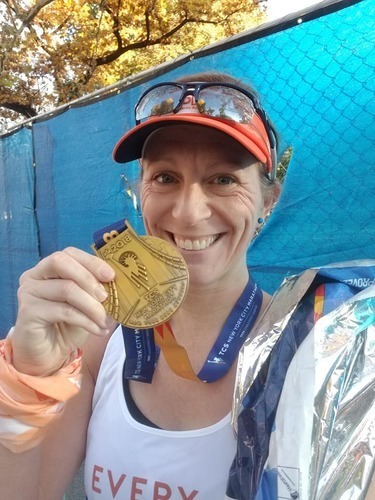 My favorite part may have been the live course description, which helped give tips and tricks to running your best marathon. I was very anxious about making it to the my corral on time at race day. I rode the subway from Queens to Staten Island. It took about one hour. Then, the ferry ride was about 30 minutes. Then, we took a bus to the start area, which seemed to be the longest leg of the trip. But, all in all, the transportation to the start area was a well-oiled machine. Once you were in your corral it was about another 30 minutes until you started the race. There were lots of porta-johns in the corral so don't stop to go to the restroom when you arrive at the start area! You will have time to go when you get to your corral. As soon I started the race, I tried to find my groove, but stay under race pace. My goal was to run my first half slightly slower than my second half of the race. Well, no problem there because it took about 3 miles before I felt like I could move forward! That was to be expected, however, with the amount of people in this race. It was amazing! The crowd support is like nothing I have ever experienced. If I got tired, I would run on the right or left side and get high fives and cheers to help lift my spirits. There were so many signs and sights to take it! It was a great distraction and made the race go by that much faster. At the finish, my only disappointment is they stopped taking photos with the NYC Marathon backdrop. I don't know why they shut this down but it made me a little sad. I did end up getting some nice photos at any rate. Picking up my drop bag was easy and I was out of Central Park in about 30 minutes. 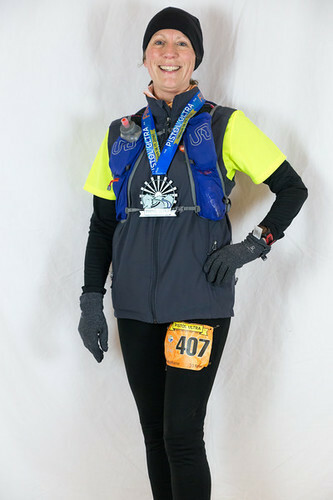 It helped that the weather was great-I ran in tank and skirt and was very warm most of the race. My advice is don't blink and soak it all in. This is not just a race, it is an experience! I will always remember it. "You never forget your first 50K - The Pistol does not disappoint!" This is a 10 mile loop course with multiple distance options. The course is set in a park setting and is on a paved trail. Hands down, this is the most organized race I've seen. From the communication prior to the event (you are never left with unanswered questions) to the personalized attention I received from the volunteers during and after the race, I am just in awe. 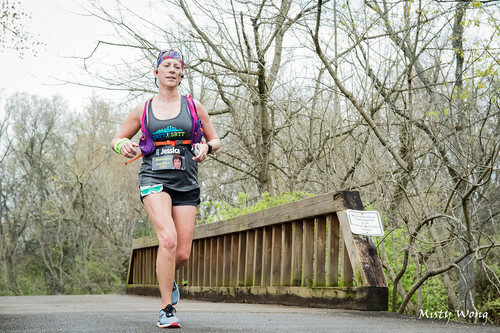 The expo is smaller, but great swag for runners and also includes a guest speaker (this year was Catra Corbett who is an amazing ultrarunner), lots of free activities, swag giveaways, and a spaghetti dinner. The event loop starts and ends at a school gymnasium, where you can hide from the elements before and after (or during) the race. Parking is all located close to the start/finish line/expo area. There were 3 aid stations on the course and they are packed with everything that you need (water and tailwind provided as liquid hydration). The park is fairly flat with a few hilly portions, but it is not a technical course by any means. Everyone is so nice and supportive; I think this is a great race for newbies but probably also seasoned ultrarunners because there were alot of returning runners to this race! I highly recommend it for anyone wanting to jump to the next distance in their running journey. "Color me happy - Racing for Retts"
I ran the Color Run this year to raise awareness for Rett Syndrome. This is not a 5k for serious runners-the race is not timed and there are no awards for age groups! What you will find are MANY happy volunteers and participants. Packet pick-up is a breeze. There were a little over 5000 people registered for this event. The packet pick-up the day before, well there were no wait lines. A little different for the day of the event, but the start times START at 8 and waves are released every few minutes for 30 minutes so you don't have to worry if you are a little late. This race is great for little kids, strollers, adults and those who want to run a fun, stress free 5K. There are water stations on the course, but beware they are water bottles, so you will have a bottle to hold until you find a trash or recycle can. The course is flat and you go through 4 color stations and a foam station before hitting the finish line party. The finish line party includes a HUGE color explosion every 15 minutes and great music. It is generally a fun, positive atmosphere. The swag is great- a cool t-shirt, snacks, coupons, etc. And you DO get a unicorn medal at the end for those that love bling. A great race for families to do together and raise money for a charity.